​We hope that everyone, from the youngest to the oldest, feels welcome at Holy Innocents’ and encouraged to become part of our community. This certainly includes young families, of whatever shape and size. Like Jesus, we are delighted to have children and young people in our midst. Children are welcome at any of our Masses, including during the week. We celebrate our Sunday 10 am Mass as a Family Mass each week, with Baby Chorus for parents with babies and toddlers, Children's Liturgy for children in Reception class and up to Year 4 and (once a month) Faith, Hope and Fun for 8 to 12-year olds. We have a monthly "Children's Mass", especially accessible to younger children, normally on the first Sunday; and a monthly "Youngsters' Mass" with older youngsters involved in various ministries, normally on the third Sunday. Parents are the main teachers of faith to their children; so much so that the Catholic Church talks about each family being "a domestic church". That's why we place families at the centre of our work as a parish for children and young people. We try to support parents in fostering the faith development of each child and young person within the sacramental life and community of our parish. Not just during times of sacramental preparation, important though the sacraments are, but throughout their childhood and teenage years. Many parishioners are involved in leading and helping with all of this – perhaps you might like to join them in this most rewarding of ministries. We take Safeguarding seriously, so each of our volunteers is vetted through the Disclosure and Barring Service (DBS) process. Contact Kathryn Murrell or Kath Greenwood via the Parish Office. We encourage children, particularly once they have received their First Holy Communion, to become involved in parish life. Many of our young people become Altar servers or Readers, or join our Musicians and singers, or become Welcomers. 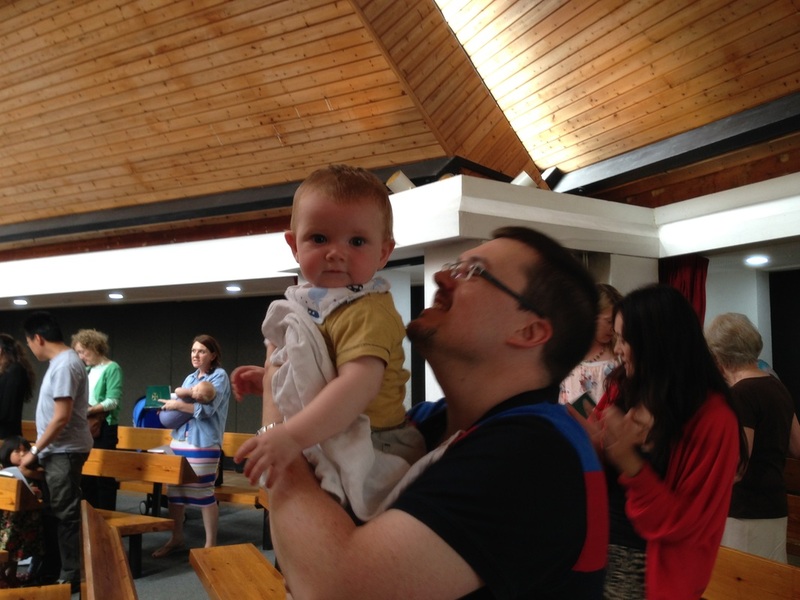 We love having babies and toddlers at our Masses, particularly the 10 am Sunday Mass. But if you bring your baby or toddler to Mass, you might well find it hard to concentrate and look after them at the same time. That’s where the Baby Chorus comes in. Baby Chorus meets most weeks during the 10 am Mass. Starting off in church, you’ll be invited to go with your pre-school age children into a separate room, where the parents celebrate the Liturgy of the Word together as the children play, before joining the rest of the congregation again for the Offertory. In 2013, a group of parishioners embarked upon a deanery-led Catholic Youth Ministry course, aimed at equipping and energising them to support the growing faith of young people in the parish, seeking to create access to faith opportunities for young people both within and beyond the parish. It also aims to communicate with and support other groups in the parish working with and for young people. Together they have organised various services at Holy Innocents’, including a memorable Youth Mass and wonderful celebrations of the Stations of the Cross during Lent. They have participated with the young people in deanery-wide faith events such as the Christ the King Day, and encouraged participation in other faith opportunities outside the parish. In addition, they have been involved in the launch of the deanery-level Faith in Action award scheme for young people in the parish, which was launched at the beginning of 2017. Our Children’s Liturgy group is available for children in Reception Class and up to Year 4. They meet during the 10 am Mass every Sunday (except for the first Sunday in each month and with a break in August). Faith, Hope and Fun is a group for 8 to 12-year-olds that meets on the first Sunday in each month during the first part of the 10 am Mass before rejoining the congregation for the Offertory. The activity-based sessions help the youngsters to develop their faith in a fun setting. Holy Innocents’ is a successful school, with high standards academically and spiritually. The Ofsted and Diocesan inspections in 2017 clearly identified our many strengths and achievements. As a Catholic school we aim to ensure that the children’s spiritual, moral and ethical experiences are not confined to RE lessons but become a way of life. We are fortunate to have experienced, skilful and creative staff working in partnership for the benefit of all pupils. We place great importance on the creative element of the curriculum and encouraging links to be made where possible thus supporting the whole child and enabling access to the curriculum. There is a wide range of clubs before, during and after school, to extend pupils’ sporting and academic interests and to promote a healthy lifestyle. The school also provides on site, before and after school care. The school has an active Parents and Friends Association (PFA), which raises money for the school throughout the year. Parents are welcomed into the school in many different capacities; assemblies, plays, reading and school trips. We pride ourselves on being a caring and inclusive community with close links to the parishes of Holy Innocents, St. Michael & All Angels and St. Theresa’s Biggin Hill. We are located within an attractive, green field site with playing fields and separate playgrounds for Early Years, Key Stage 1 and Key Stage 2. ​As we help parents to nurture the faith of their children as they grow up, the celebration of the sacraments of initiation – Baptism, First Holy Communion and Confirmation – mark important stages on this journey. Our sacramental life page explains how we prepare children, young people and their families for these sacraments. We have a very active range of uniformed groups – Rainbows, Brownies and Guides for girls, and Beavers, Cubs and Scouts for boys. Based in the Scout and Guide Hut on the Holy Innocents' School site, these groups attend a parade Mass every other month, when they combine with the youngsters' Mass. The groups meet regularly during term time. The premises are maintained by the Joint Supporters Association who welcome help and support from parents and carers. Visit girlguiding.co.uk or scouts.org.uk for general information.